The appendStream method on the sourceBuffer object and algorithm steps that are used only by it. The VideoPlaybackQuality object and the HTMLVideoElement Extensions that use it. 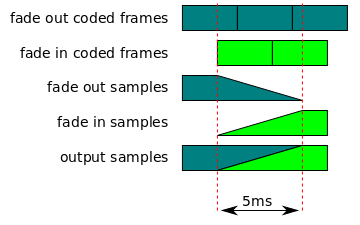 The totalFrameDelay attribute on the VideoPlaybackQuality object. Text in the resource fetch algorithm that refers to "the download" or "bytes received" refers to data passed in via appendBuffer() and appendStream(). References to HTTP in the resource fetch algorithm do not apply because the HTMLMediaElement does not fetch media data via HTTP when a MediaSource is attached. Text in the resource fetch algorithm that refers to transitions to "NETWORK_IDLE" and firing "suspend" events, and the paragraph that begins with "User agents may decide to not download more content at any time", do not apply to a media element that has a MediaSource object attached by this algorithm. The following section is OPTIONAL. There are several implementations of the current specification, but it is subject to change because some feel it needs further work. The community is actively investigating alternate designs to provide feedback on media playback quality. See Media Playback Quality. The following section uses VideoPlaybackQuality and is OPTIONAL. There are several implementations of the current specification, but it is subject to change because some feel it needs further work. The community is actively investigating alternate designs to provide feedback on media playback quality. See Media Playback Quality. Issue 5 - Add support for customizing HTMLMediaElement.seekable on live streams. Issue 87 - Add VideoPlaybackQuality to the list of at risk features. Issue 69 - Add optional & subject to change language to VideoPlaybackQuality. Issue 78 - Update reference from HTML5.0 to HTML5.1. Issue 18 - Clarify fetch algorithm failure detachment trigger. Issue 24 - Clarify MSE attachment stops delaying the 'load' event, and MSE disables 'suspend' event logic. Issue 44 - Used SVG and longdesc for pipeline diagram. Issue 67 - Excluded createObjectURL() from Service Workers. Issue 68 - Made kinds attribute and ctor argument use sequence type. Issue 10 - Updated createObjectURL() to align to current (April 2015) non-autorevoking createObjectURL()[ FILE-API ] method. Encouraged web author use of revokeObjectURL()[ FILE-API ].